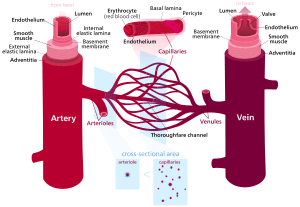 A blood vessel is a tube that carries blood in the circulatory system. Blood vessels that take blood away from the heart are arteries. Blood vessels that take blood back to the heart are veins. Capillaries are between veins and arteries and they supply tissue with blood. The heart plus all of the blood vessels in the body together are called the circulatory system. Blood is moved by the pumping of the heart and carries oxygen to the tissues. The expansion of blood vessels is called vasodilation, it helps the body to get rid of heat energy (vas- in Latin means "container" or "vessel"). The constriction of blood vessels is called vasoconstriction, it prevents the body from losing warmth. An Oil Immersion Image of a Microscope showing the relative differences between (A) Artery and a (V) vein. Blood vessel Facts for Kids. Kiddle Encyclopedia.